Ever since David Neeleman stepped down as CEO of JetBlue "to focus on more long-term strategic initiatives for JetBlue as Chairman of the Board," his famous blog, called a flight log, has stood silent. The last post penned by Neeleman gives an outstanding welcome to Dave Barger as CEO, but leaves the people who enjoyed Neeleman's online presence one question unanswered: Will Neeleman's flight blog remain the last word of an airline founder who saw the value of social media or will Barger now brave the relatively untested waters of CEO blogging? The question isn't so much for JetBlue as it is for any corporation that has taken the plunge. As more executives take to blogging or achieve near celebrity status as very visible spokespeople for their companies, it becomes crystal clear that very few have thought about a social media contingency plan. What happens when visible voices become embroiled in controversy or step aside as Neeleman did? One would think the Robert Scoble story would have better prepared companies for such eventualities. Microsoft fared pretty well with a transition in 2006, but it seems like not all companies will. While ADWEEK's May 21 article doesn't provide the answers, it does recognize a change in the perception of company branding with a renewed marriage between marketing and customer service. "Blogs, online video, e-mail and mobile phones—not to mention company and brand ratings on sites like Amazon and Yahoo—give the average consumer an immediate, interactive soapbox on which to share how Company X let them down," writes Joan Voight. "In today's consumer culture, a humorous video on YouTube featuring a cable repairman sleeping on the job gets far more attention than the well-established American Customer Satisfaction Index from the University of Michigan—an index that due to its business press-oriented nature can't compete with the Web." The article also mentions JetBlue Valentine's Day crisis and its efforts to employ a largely unproven social media tactic as part of its crisis communication strategy. In our case study, we noted that while the effort was to be commended, JetBlue only did everything almost right. 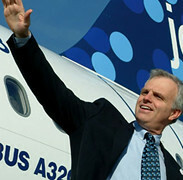 Unfortunately for Neeleman, if you subscribe to ADWEEK's assessment that it was the "episode, dissected on blogs and elsewhere, even brought down the airline's high-flying founder and CEO David Neeleman," almost was not enough to win over JetBlue stakeholders, who seemed to think the easiest way to end the over-apologizing was to shuffle their spokesman off the stage (for awhile anyway). Left behind is a flight log (blog) that will require some pretty big shoes to fill unless Neeleman re-emerges as the very verbal and likeable founder of the airline. Indeed. The communication game has changed and executives are taking more heat over the attention they receive as their personal brands and actions sometimes eclipse the company they work for. As a result, some now have bigger targets on their backs as sacrificial lambs when things go wrong. Some are shuffled around or let go for a single company slip like Neeleman or Jim Samples. Others are dismissed for what the Toronto Star, a few graphs down, calls terminal uniqueness (n. Psychological condition afflicting top executives suffused with a sense of omnipotence, until their bad behavior bites them in the behind) like Chris Albrecht, Julie Roehm, and Todd Thomson. Sure, something is being done. You cannot pick up a communication-related publication today without reading about social media. However, far too many communicators are not sure what to do with all this information because they thought the opening rounds were nothing but a fad. So, unless social media is carefully employed as part of your company's overall strategy, sooner or later, you will be left with the wrong message, or perhaps, no message at all, where customers expect to find it. Whether "it" means a flight log or something else entirely. JetBlue. Case study closed. "Congress will vote on a new air traffic control system this year – a system that will help improve airline on-time performance, reduce delays, ensure everyone pays his or her fair share, and help the environment. Our feeling, and the opinion of the Air Transport Association, an industry association we’re a member of, is the general idea of ‘you use it, you pay for it.’" — David Neeleman, writing on his flight log for the first time since May 11. It's good to see him back. There is a lot of talk in the communication profession about crisis communication, with some people attempting to pigeon hole it as a classic case, when it was not. Social media had everything to do with it. The only thing classic in this case was that the solid reputation management of the company, which was largely due to Neeleman, that helped the airline overcome some challenges. More importantly, there has been speculation that JetBlue is in the clear. I don't think so; they have a long road ahead especially without the founder at the helm (but I do have faith in new management). But even if they if they do make the airline everything it was and more, this crisis communication story does not have a happy ending for everyone as Neeleman recently sold 2.5 million JetBlue shares, or 23.2% of his holdings, the first time the airline's founder and chairman has ever sold company stock. Marketing Media: The Recruiting Animal Shooowww! Remembering A Friend: Nelson Ellis, Jr.